For centuries people have been getting tattoos. But why do people mark their bodies with ink forever? 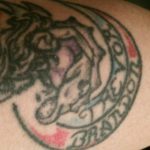 For some people, it’s because they want to express themselves; for others, tattoos hold a strong sentiment or memory, and for a good portion of people it ends up being a good story to tell. When you think of someone with a tattoo, you probably don’t picture the middle-aged adult who stands at the front of the class and lectures you daily. So it’s not common to pair teachers and tattoos together. Penn Manor has more tatted teachers than you may know. 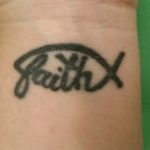 Ms. Beck’s tattoo of a fish with faith written in it on her wrist. Science teacher Ms. Tonya Beck has two tattoos. On her calf she has a mom holding a baby with her kids’ names which she got in 2010. Four years after she got another tattoo on her wrist which reads “faith”. Ms. Beck said she would definitely get another tattoo. “I got them to express things important to me,” she said. FCS teacher Ms. Elizabeth Sheerer got her first tattoo in her freshman year of college on her back. Her tattoo is a rose and vine that forms a treble clef. Ms. Beck”s tattoo of a mom holding a baby with her kids names, on her calf. Teachers are just like any other person, so does a teacher having a tattoo make them easier to talk to? “I think it makes us seem more down-to-earth, or easier to talk to,” said Mrs. Jennifer Kroesen, math teacher. Mrs. Kroesen got her first tattoo eight years ago on her foot. “I absolutely think it opens up conversation,” said English teacher Ms. Lisa Mayo. Ms. Mayo’s ankle with an Orioles logo. 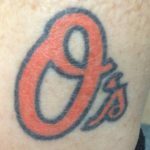 Ms. Mayo has a Baltimore Orioles logo tattooed onto the inside of her right ankle. Two years ago she got it because she wanted to “make a commitment”. For some people, getting a tattoo is just something that happens fast, for others it takes some time. Ms. Janna Ames, biology teacher and head cheerleading coach, waited five years before actually going through with her tattoo. Just this past summer, Ms. Ames got the bible verse 1 Corinthian 9:25-27, in her mom’s handwriting, on her rib by her heart. 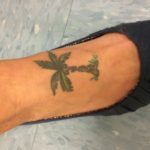 Mrs. Kroesen has a palm tree with her kids’ initials tattooed on her foot. According to Statistic Brain, about 45 million Americans have at least one tattoo. Maybe your teacher could is one of the 45 million.